The mark on this 4 1/4" long, relatively heavy at .7 T. 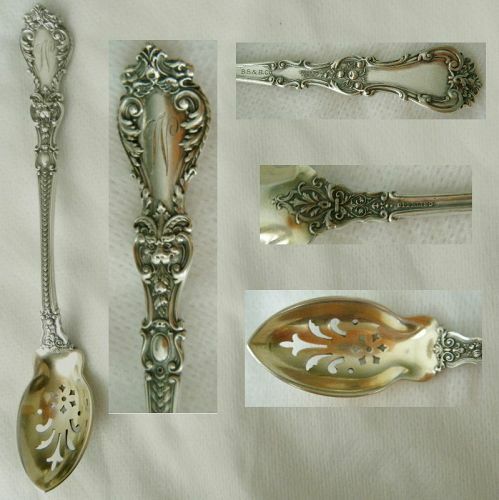 oz., tea caddy spoon with a scallop shell bowl, "S. KIRK & SON STERLING," was used by the company during the middle third of the 20th century, indicating this is sixty plus years old. The 1 7/8" wide by 1 1/2" back to front by 1/2" deep bowl has three lobes and a scalloped edge. To a European scale, meaning large compared to a typical American counterpart, this French fork measures 8 1/16" long and weighs a massive 2.8 T. oz. 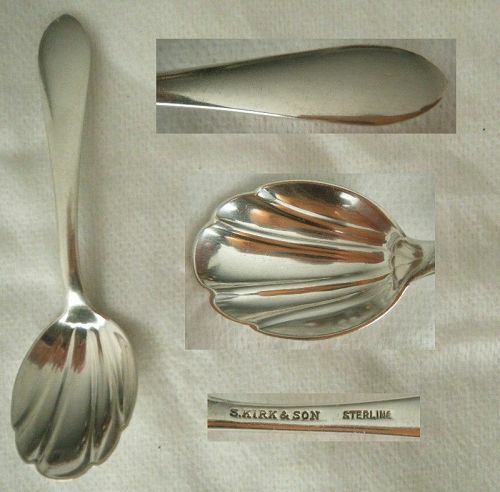 It is stamped with a first standard Minerva, indicating .950 purity silver vs. sterling at .925, and "P, spade, Q" in a caret for well documented maker Pierre Queille, 1834-46, and a bigorne assay mark. In his recently published Gorham Spoons, Chris McGlothlin expounds on this set, noting that "Each spoon of this design is unqiue unto itself because the elements were all fabricated by hand in no prescribed manner."